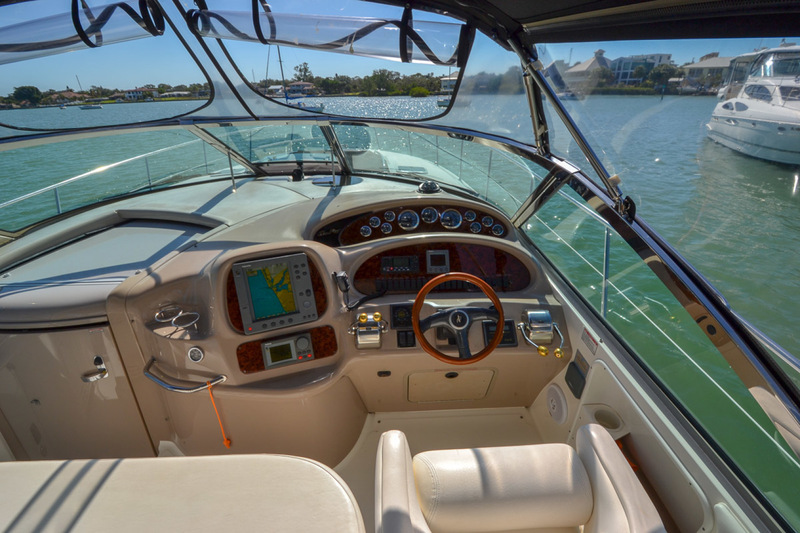 The Sea Ray 410 Sundancer is simply an outstanding yacht. 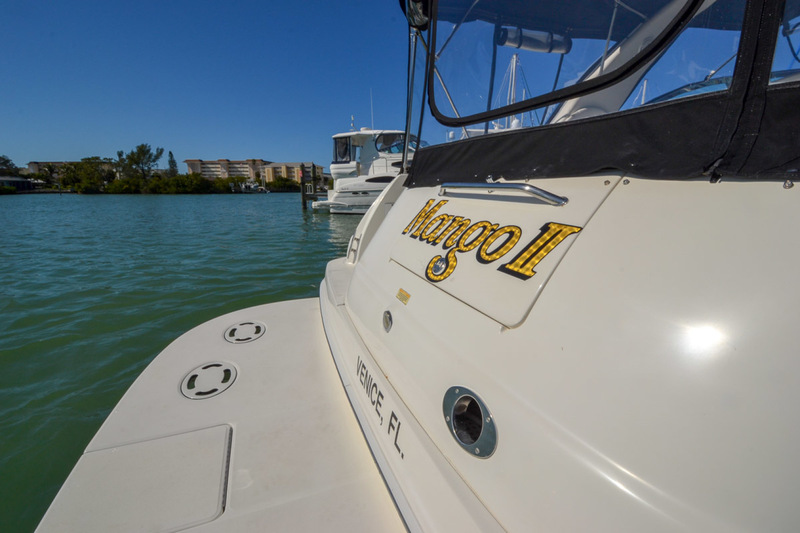 Mango II is in excellent shape with impeccable and detailed service records from current and previous owner, dating back to 2006. 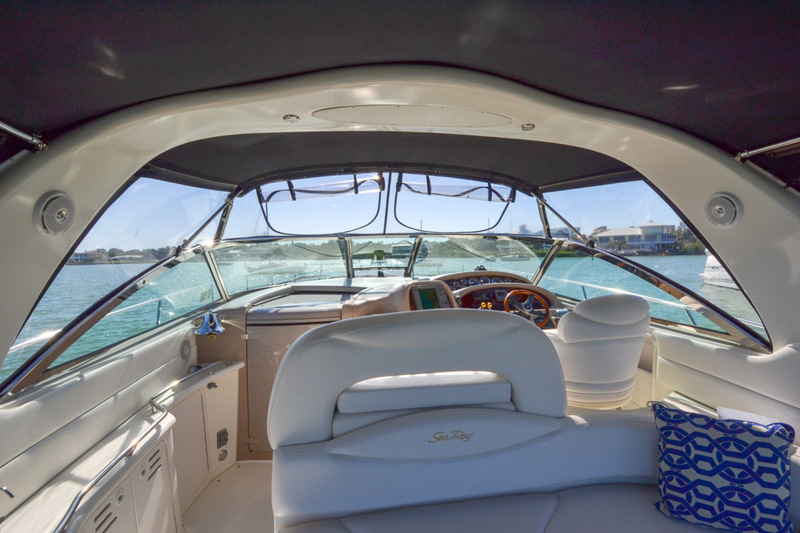 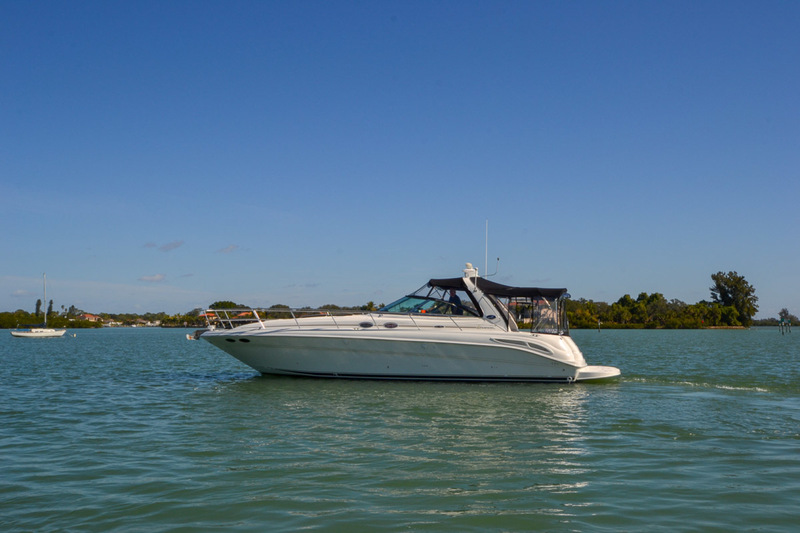 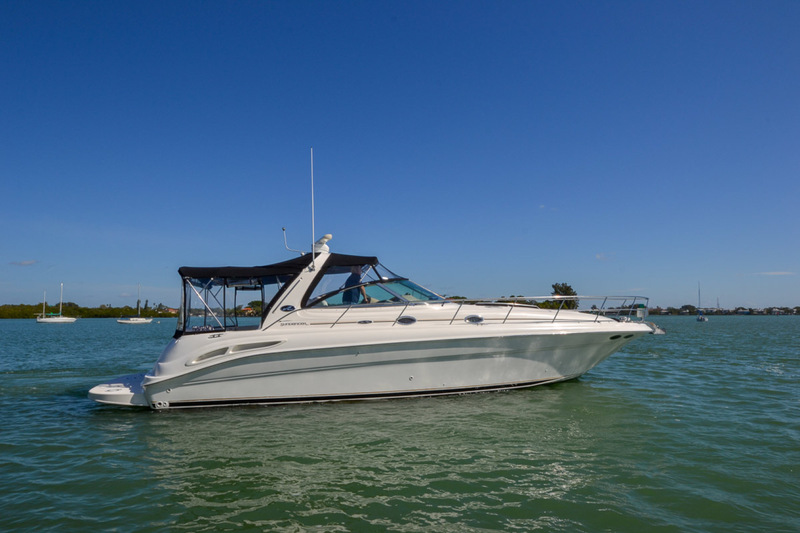 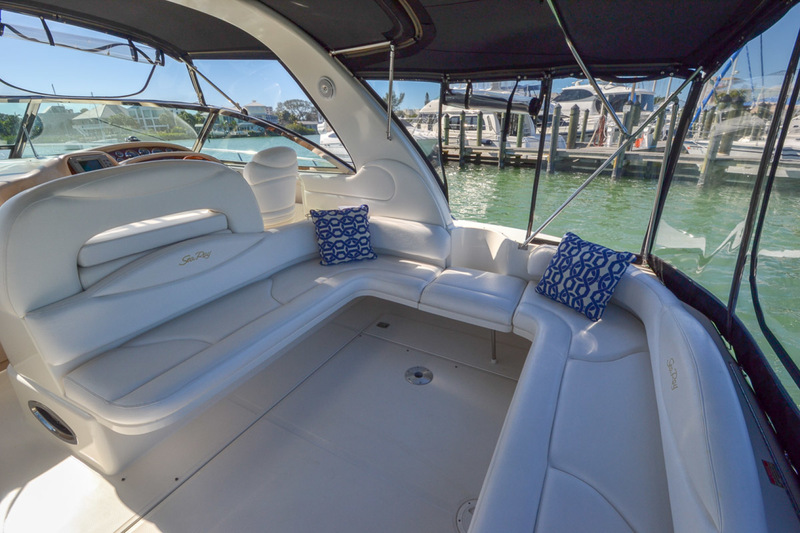 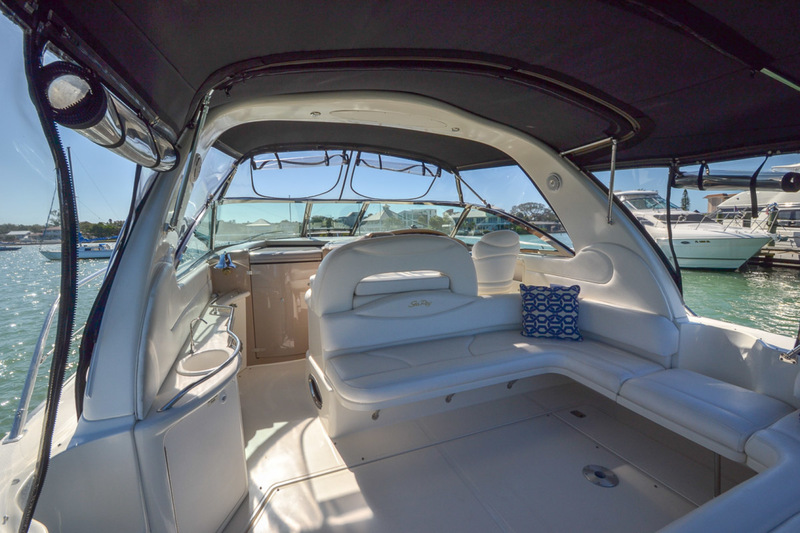 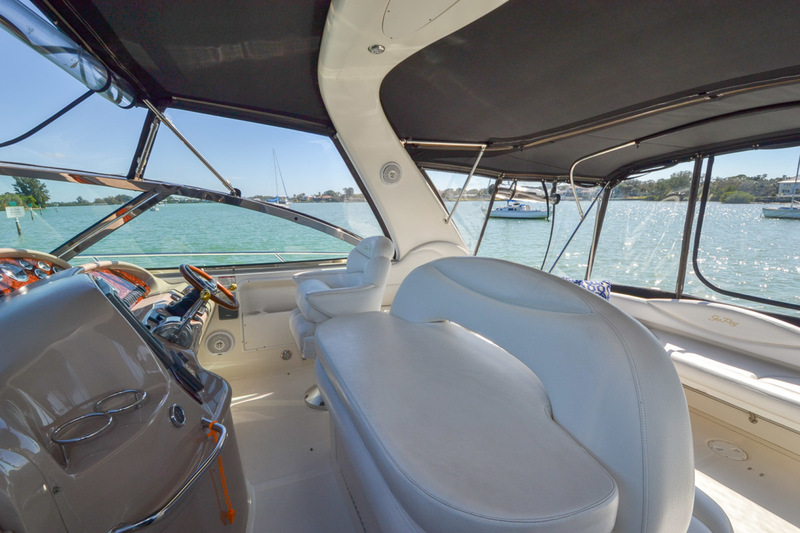 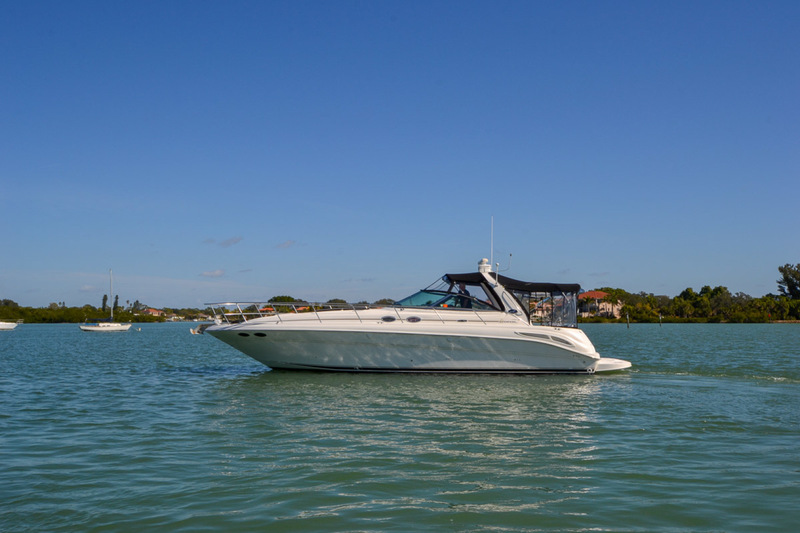 With its fiberglass sport spoiler and overhead lighting, sky screen covers on the deck hatches and rich wood accents at the helm, the styling and quality is all Sea Ray. 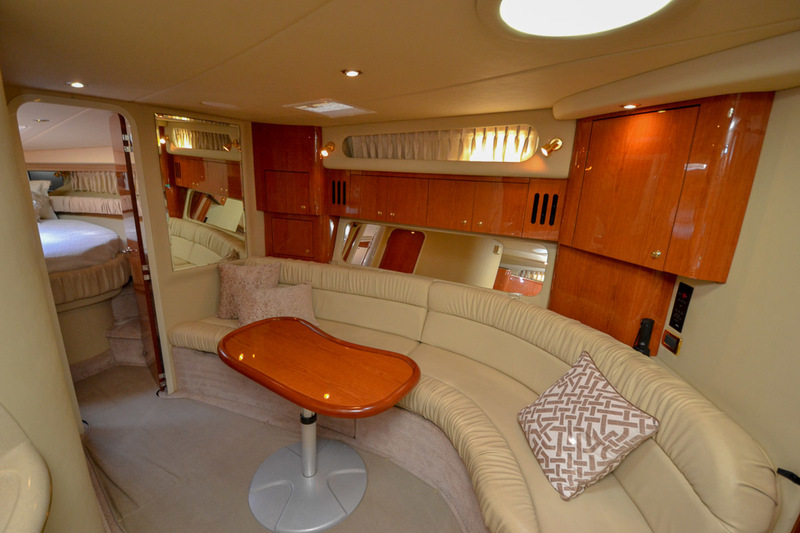 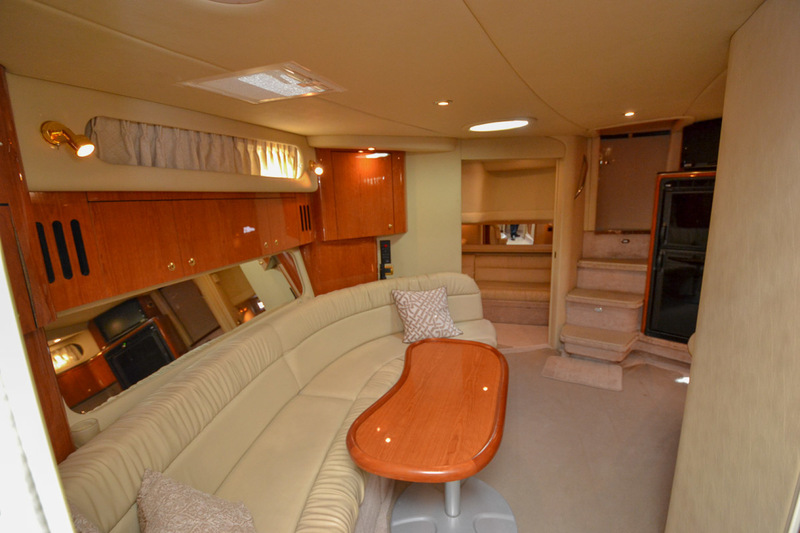 A custom slide and swivel helm seat with armrests keeps the captain comfortable while a Euro-styled companion bench seat and a generous U-shaped cockpit arrangement with a table and a sunpad provides abundant room for passengers. 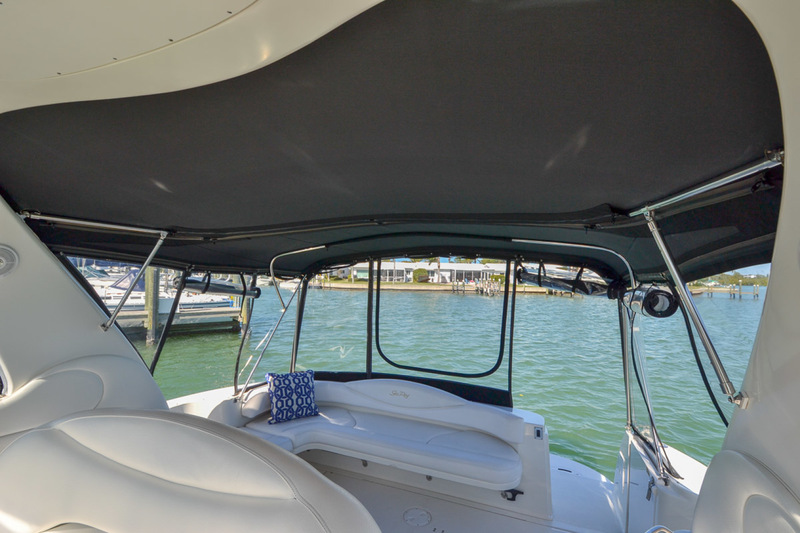 Entertaining on deck is easy with the convenient wetbar. 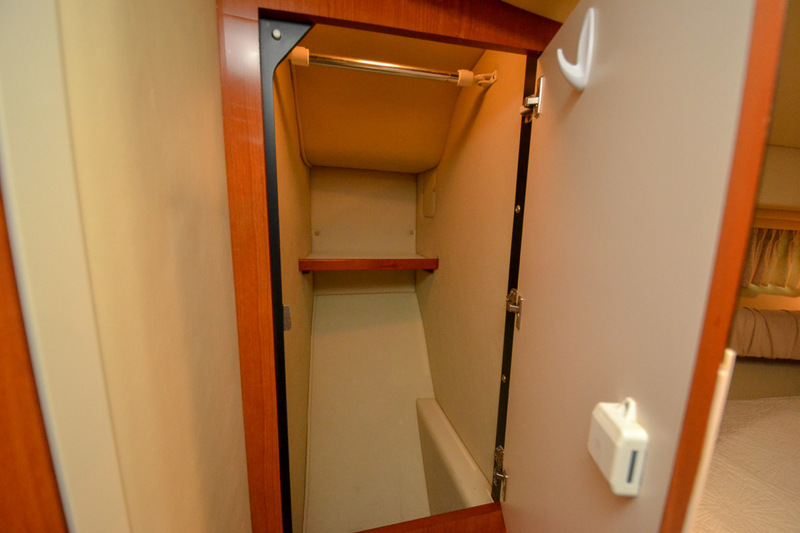 As always, storage space is plentiful. 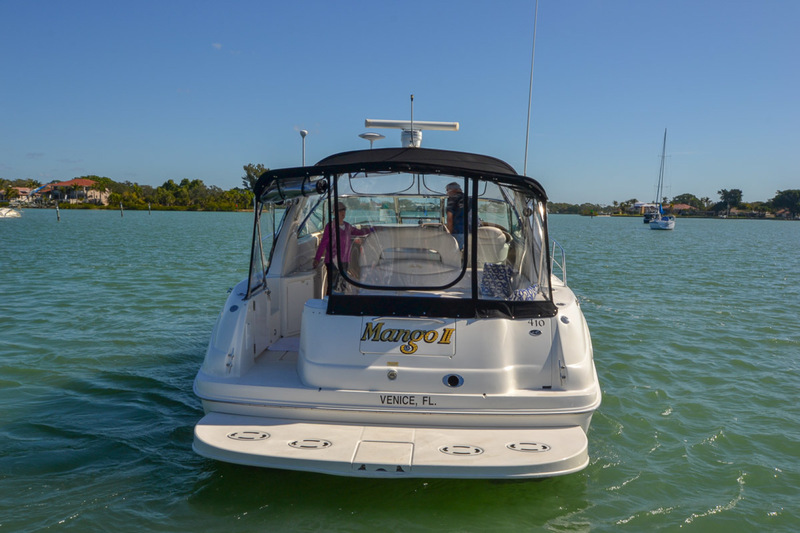 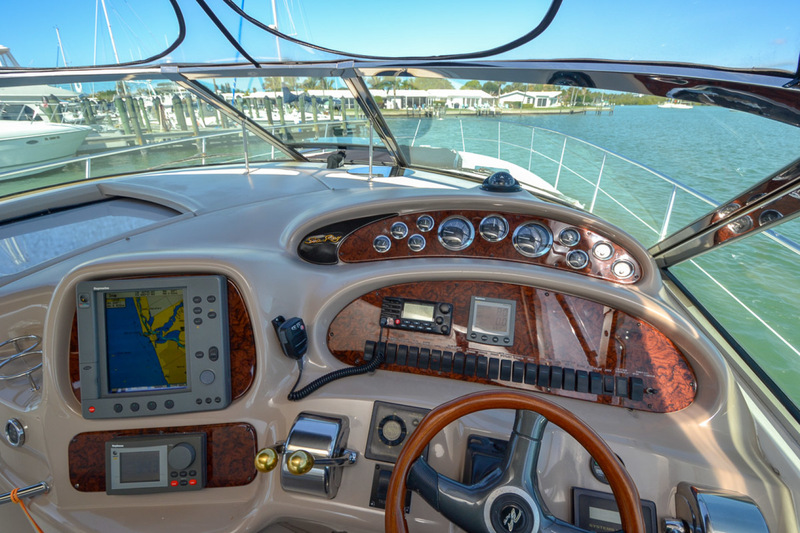 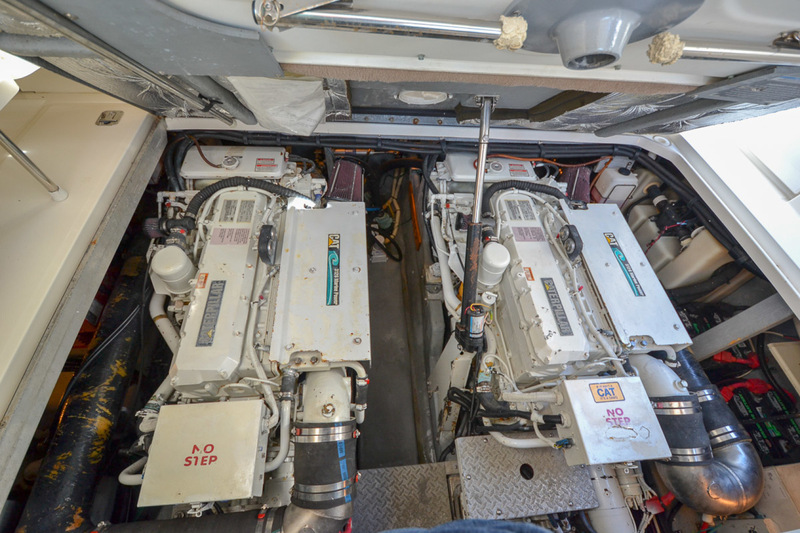 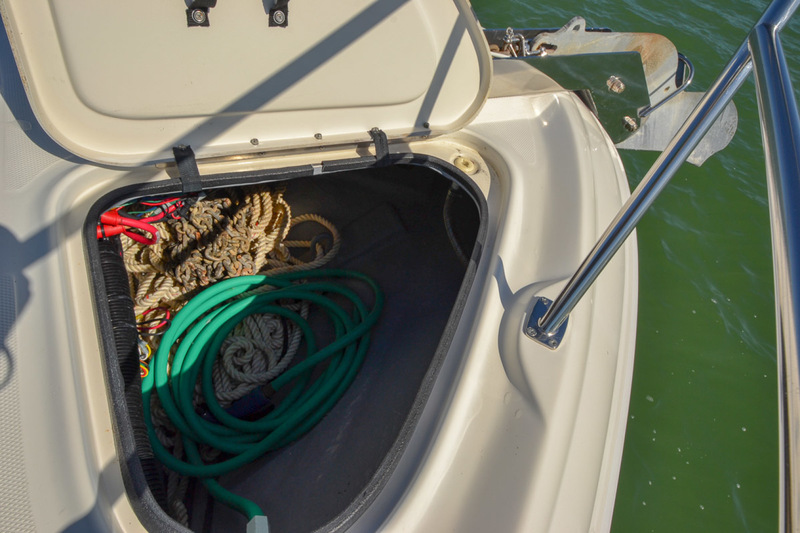 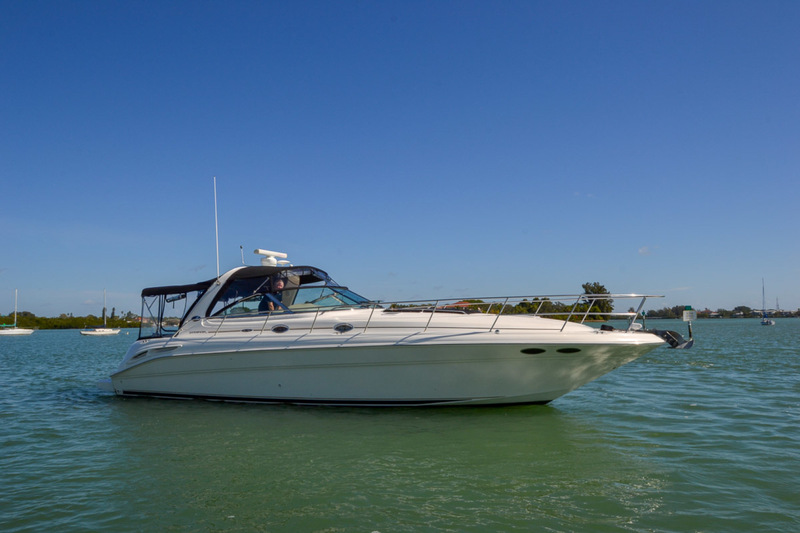 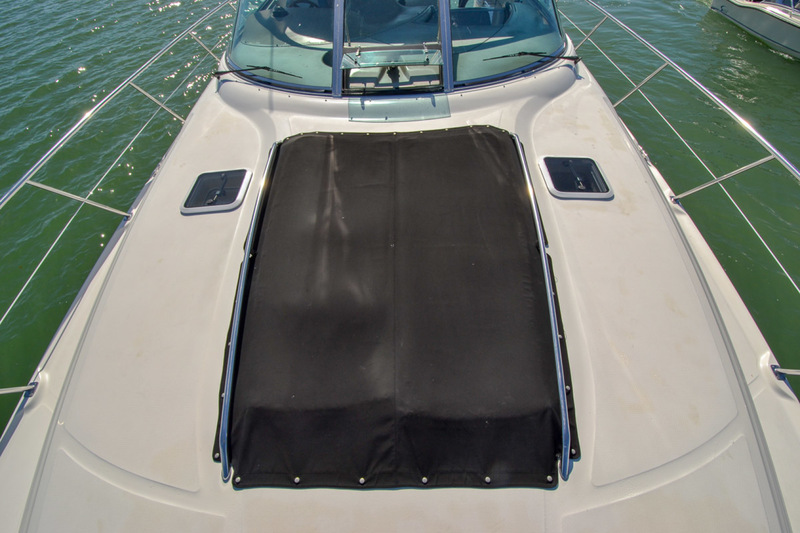 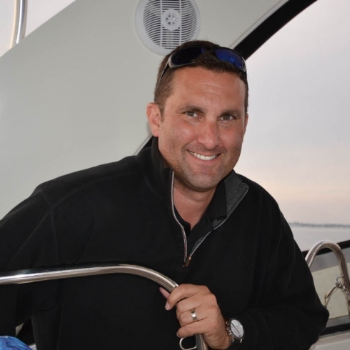 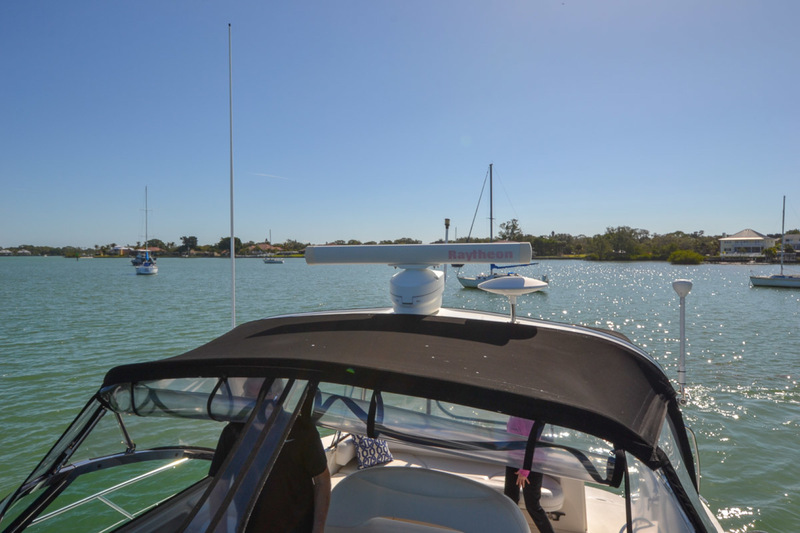 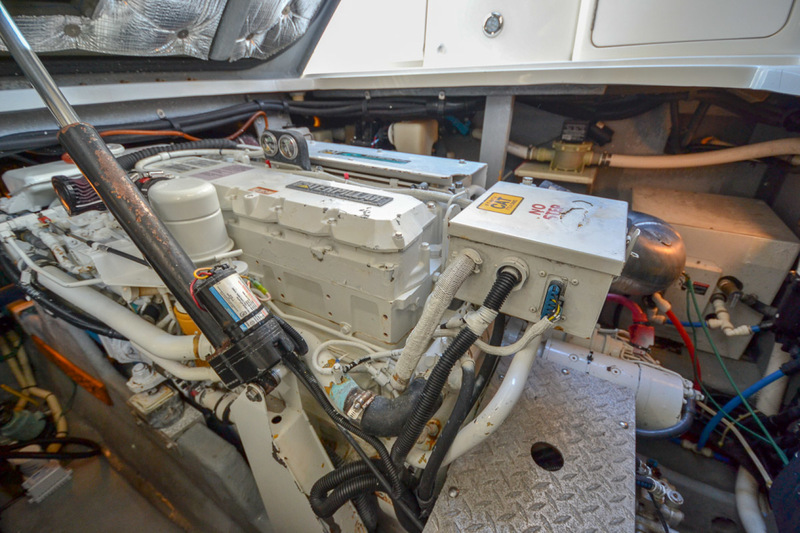 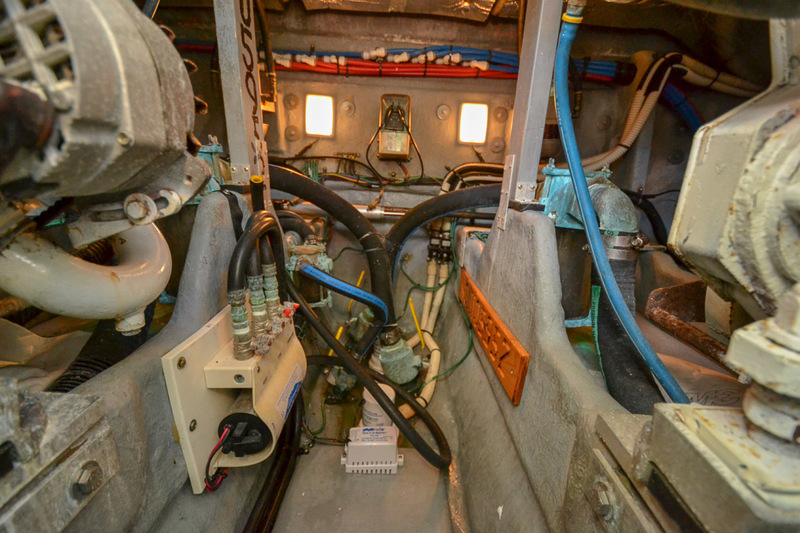 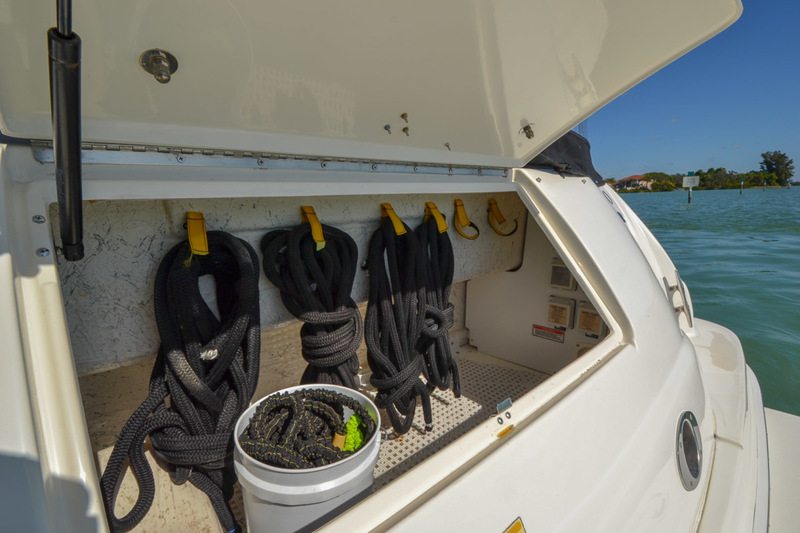 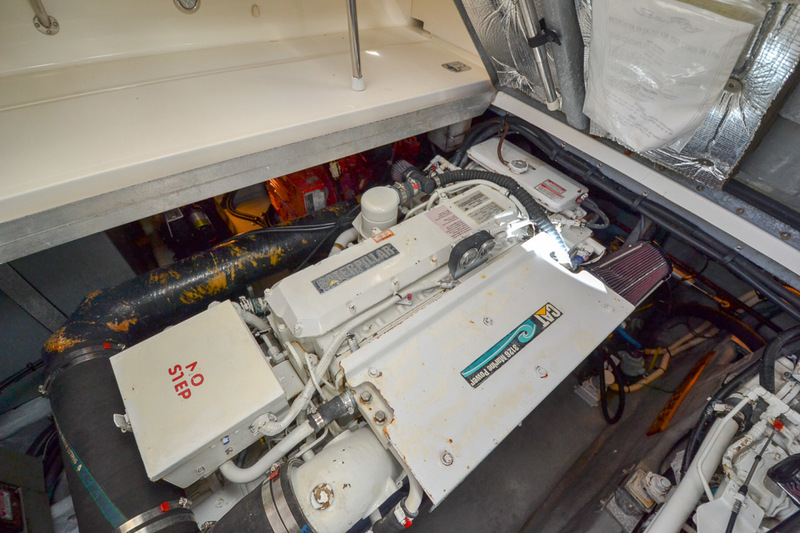 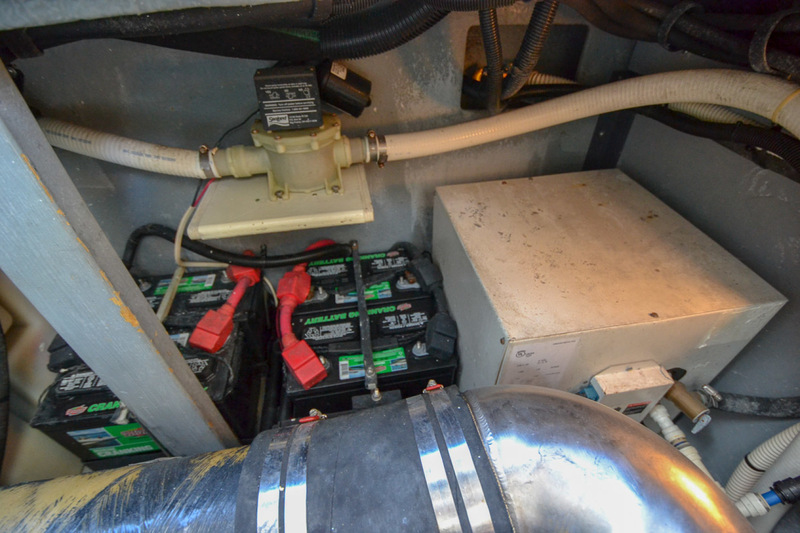 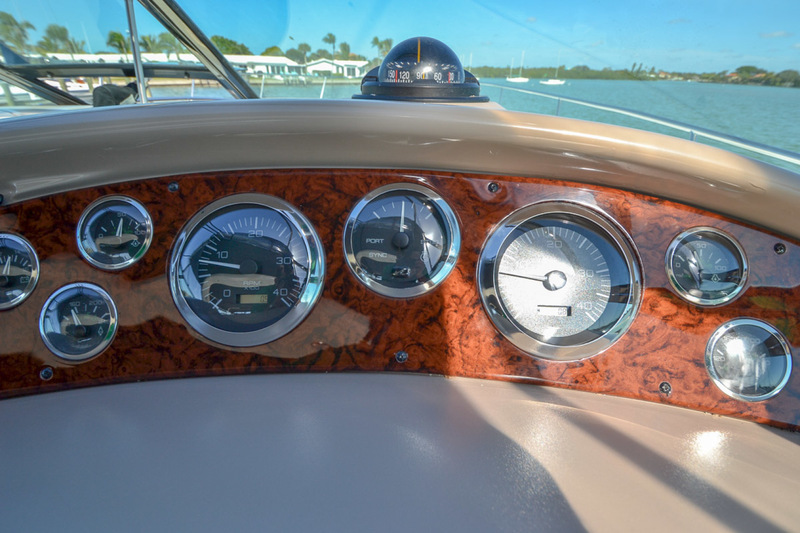 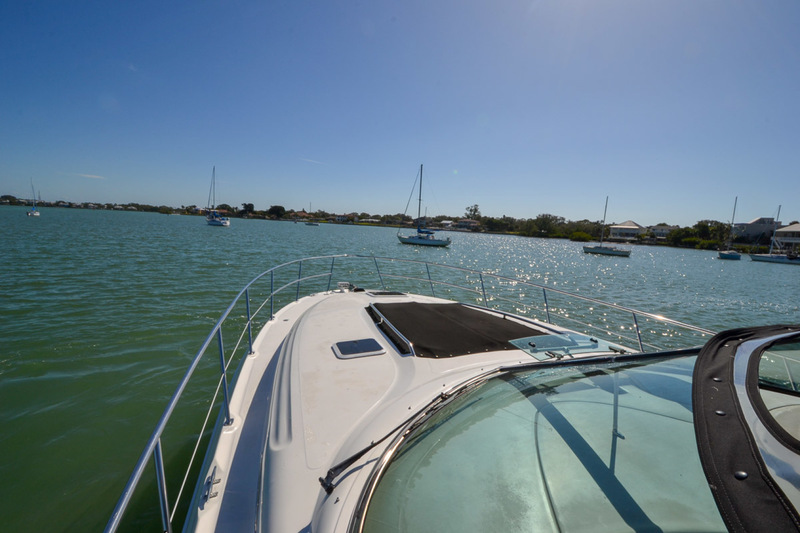 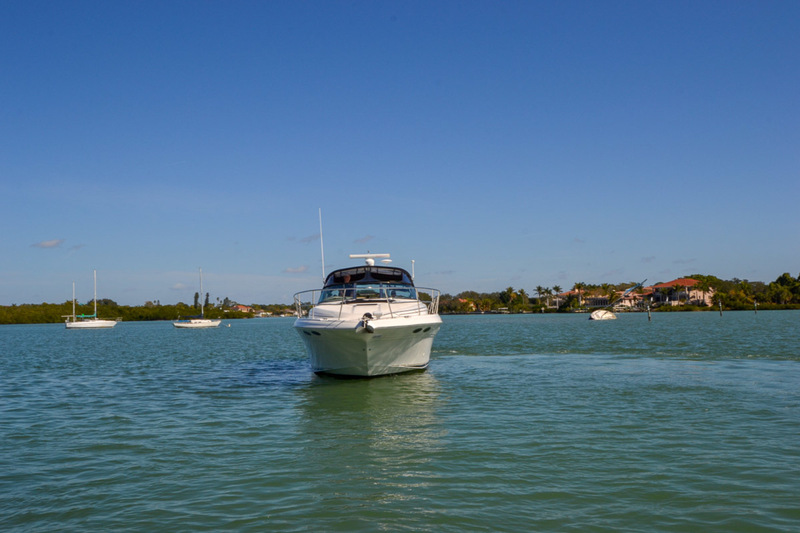 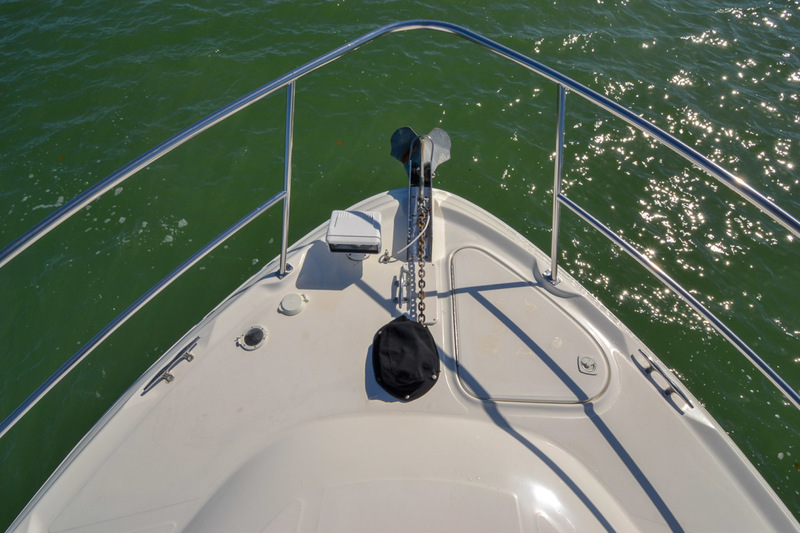 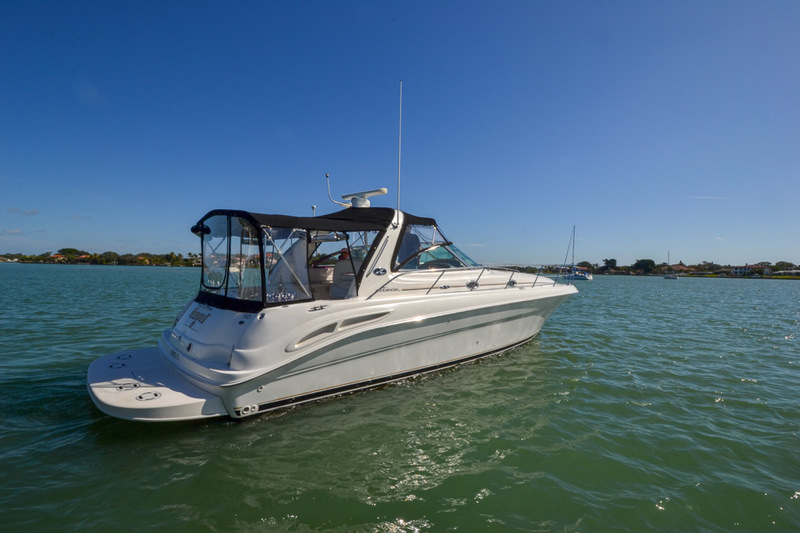 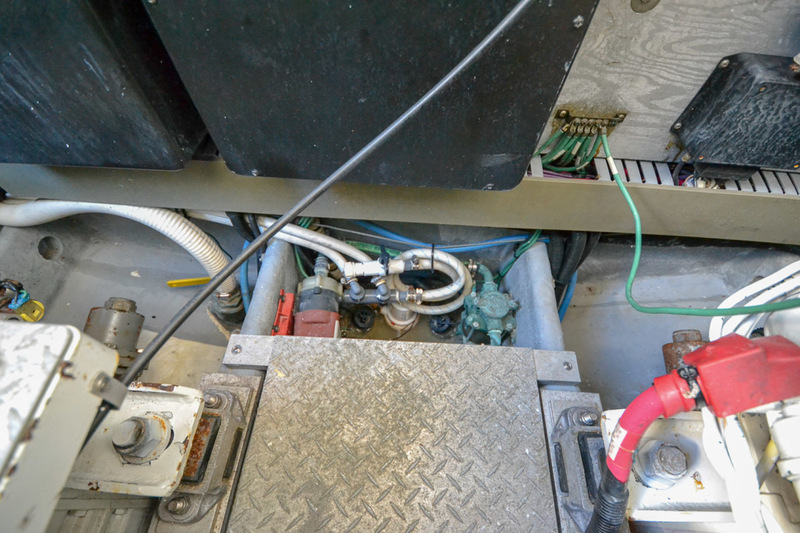 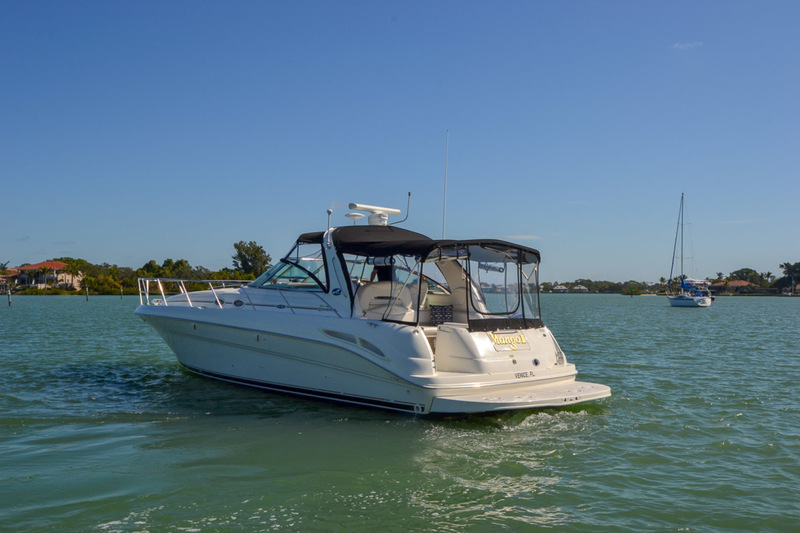 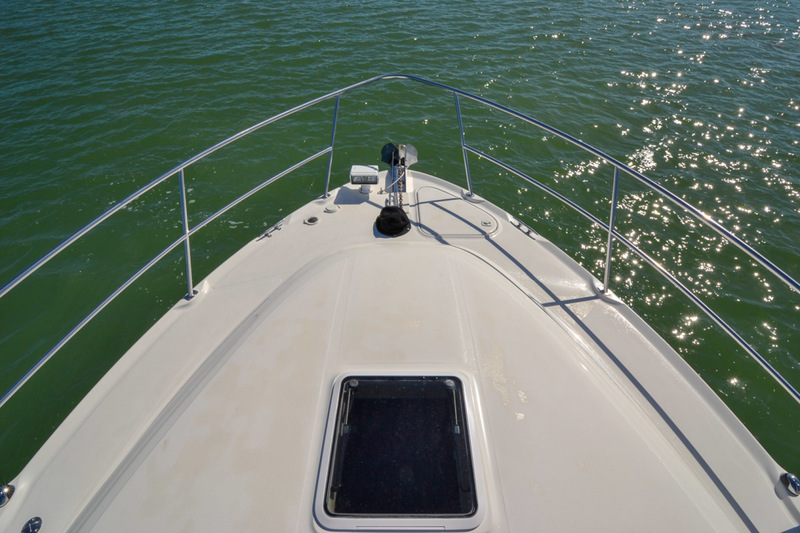 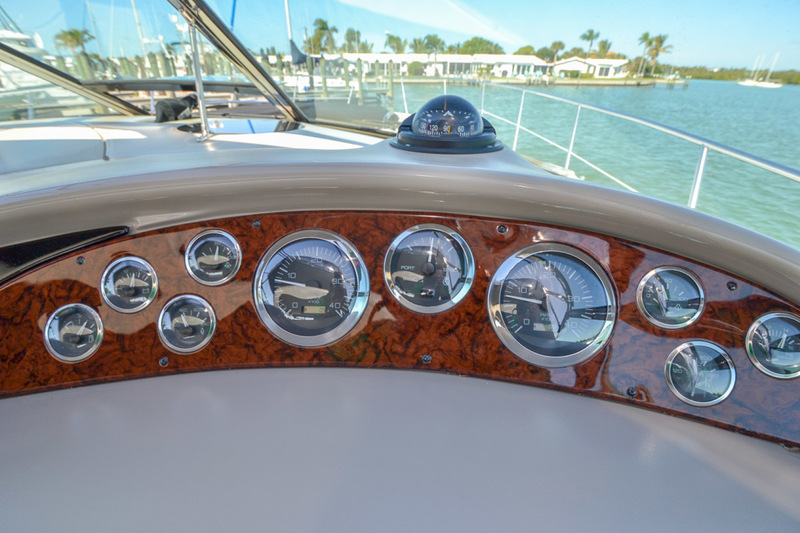 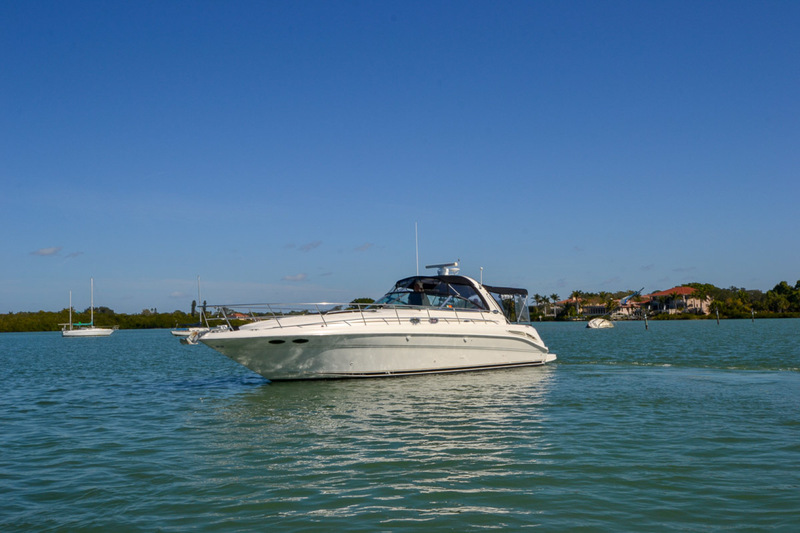 Some of the boat's standard features include a remote start generator, an electric engine hatch, dedicated aft fender storage in the transom, a Lofrans windlass, and heating and air conditioning. 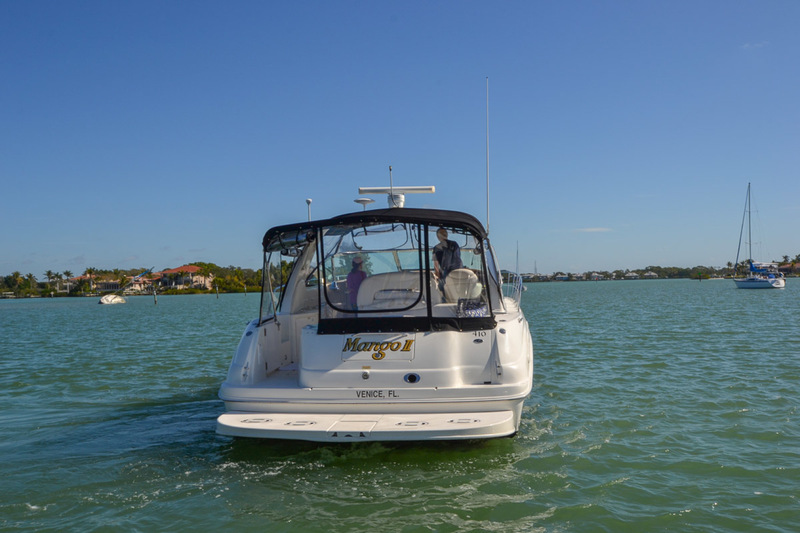 The patented underwater exhaust system means a quieter ride. 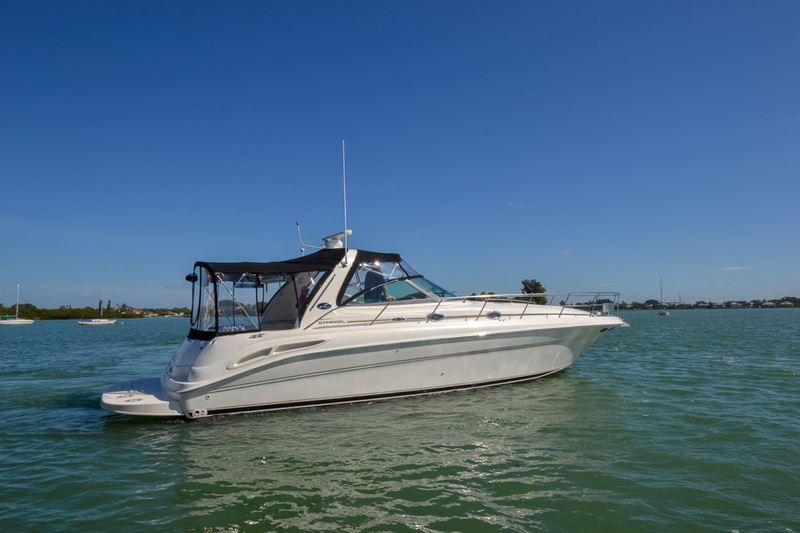 The power of the responsive twin Caterpillar 3126TA 350hp moves you along at 21 knot cruise and 27 knot top with approximately .7 MPG. 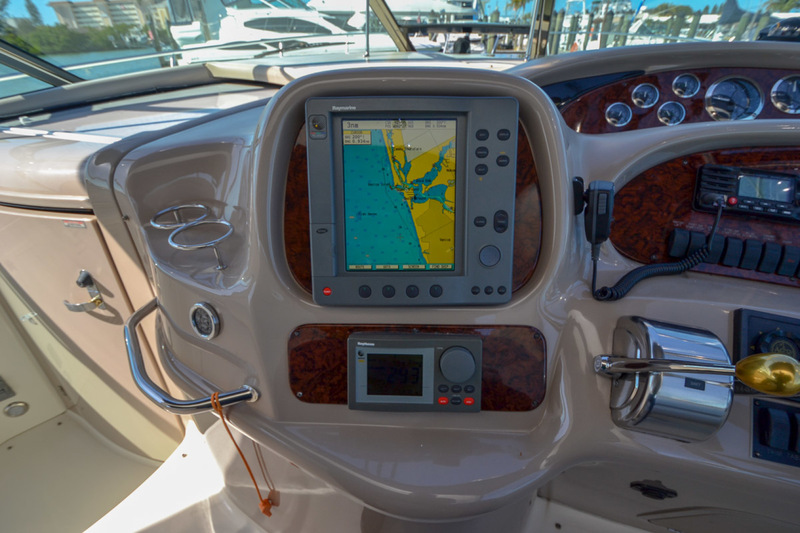 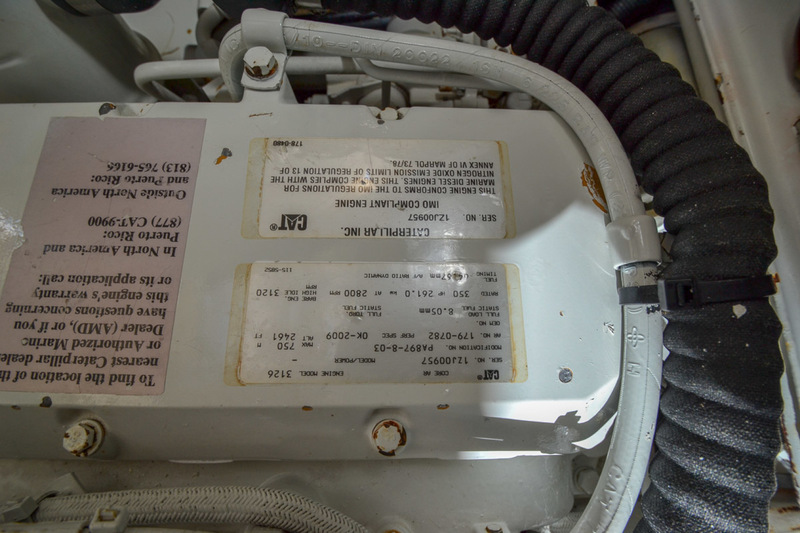 Period specific electronics package from Raytheon offers the RL80C, Radar, New VHF radio and Raydata multifunction depth finder, speed and sumlog, and water temperature instrument. 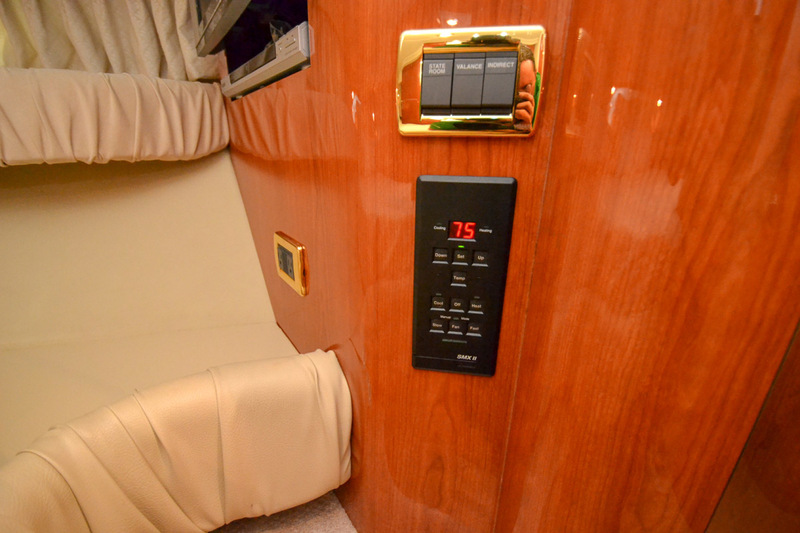 The cabin is designed for absolute relaxation. 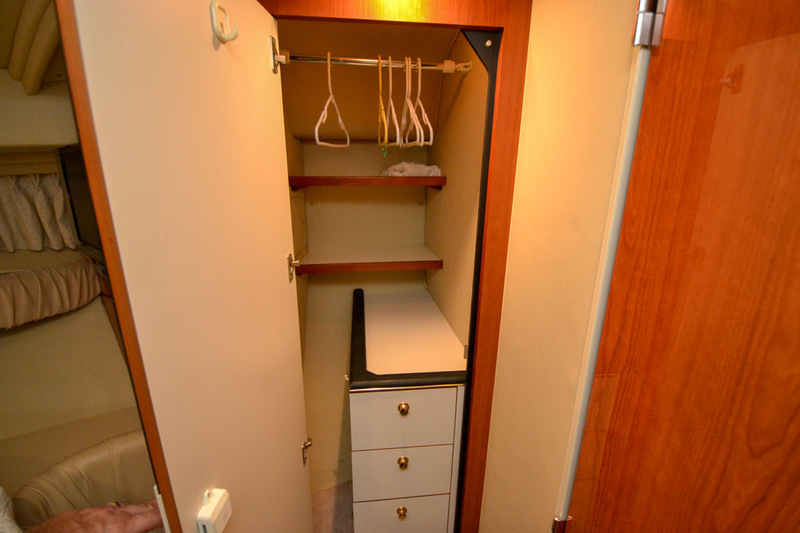 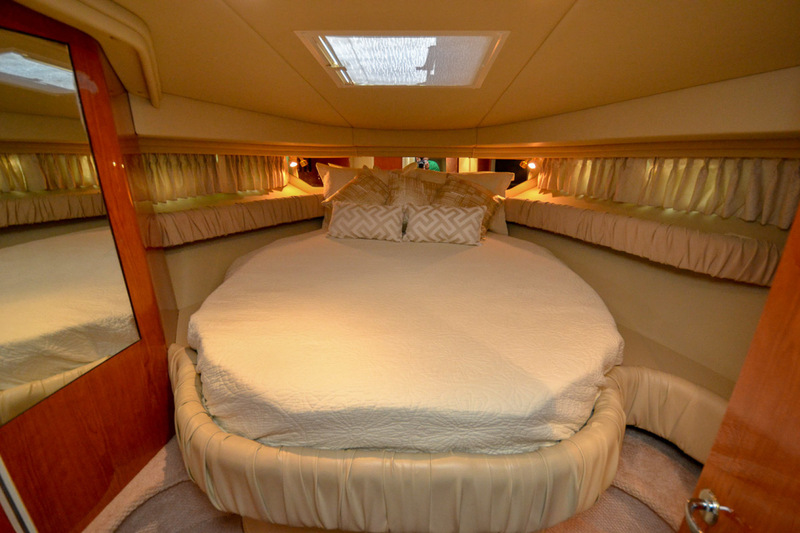 The forward stateroom has a full-size bed with coordinated linens, full-length hanging lockers, a mirrored rope locker bulkhead, port and starboard vanities with storage below and a private door to the forward head. 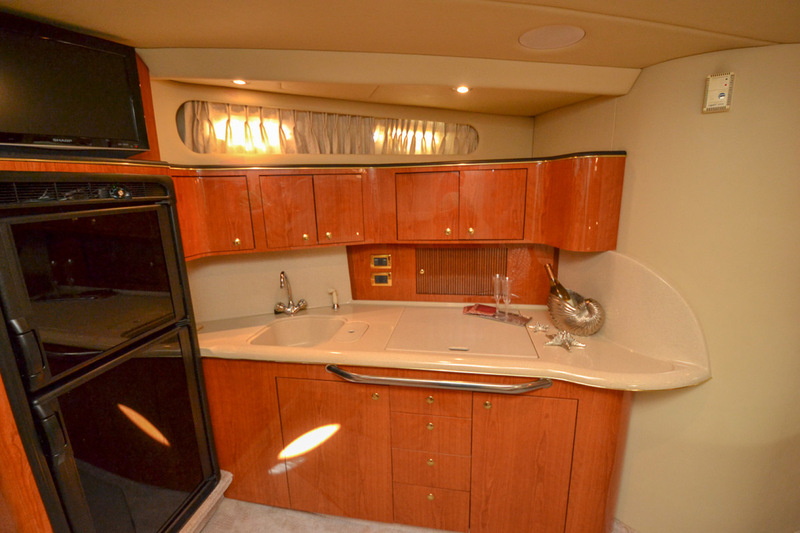 This facility's complete with VacuFlush toilet, Corian countertop, sink and storage. 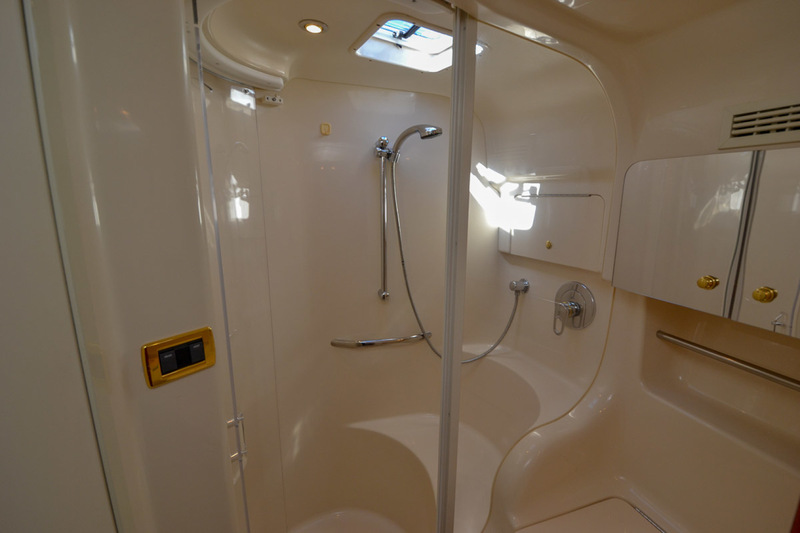 It also has a fiberglass shower with a circular acrylic door for privacy and durability. 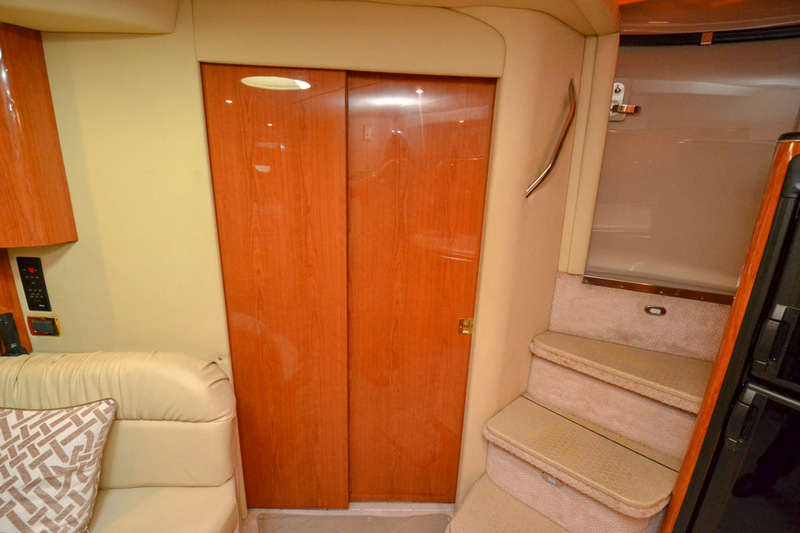 The mid stateroom serves as an ideal conversation area when the privacy door is open. 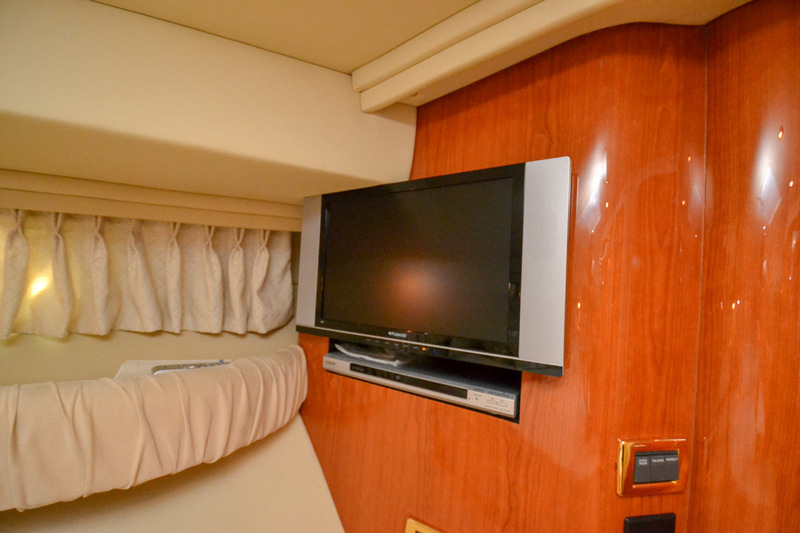 The sofa converts to a convenient double berth at the flip of a switch and the room can be closed off for extra sleeping space. 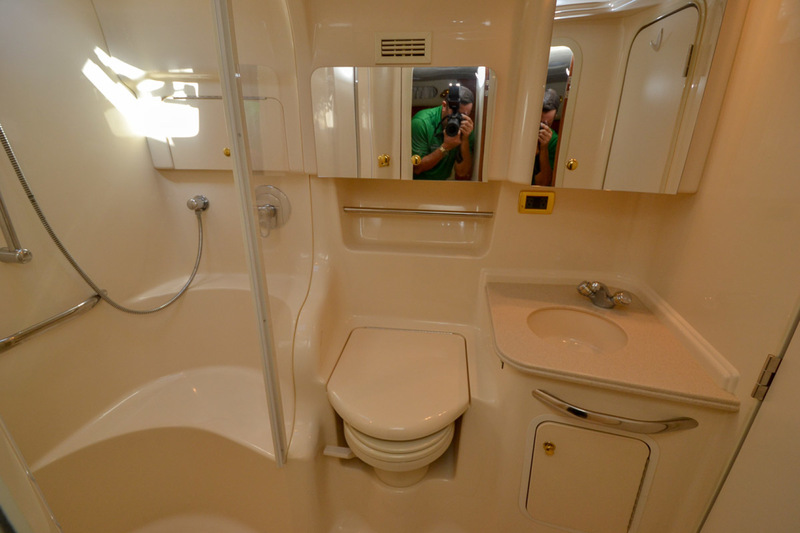 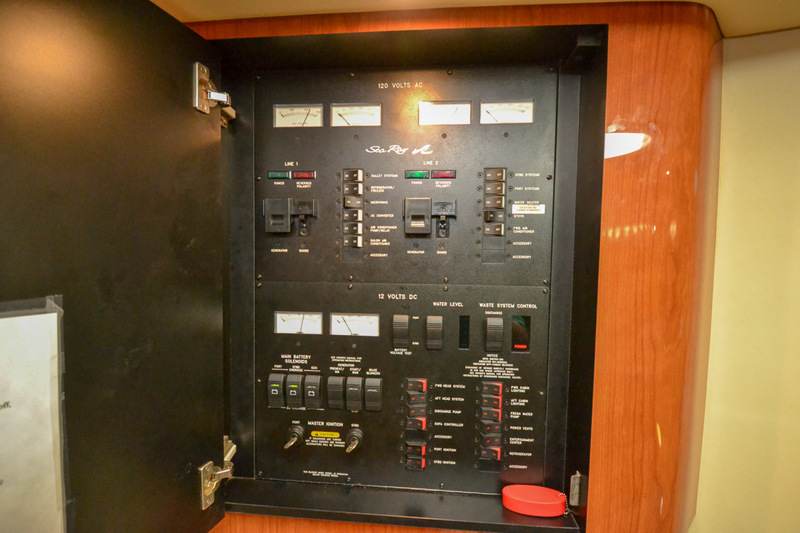 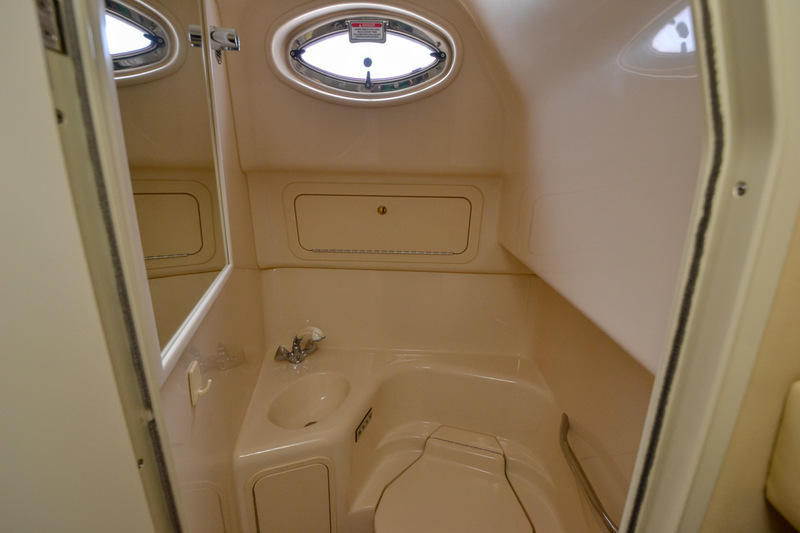 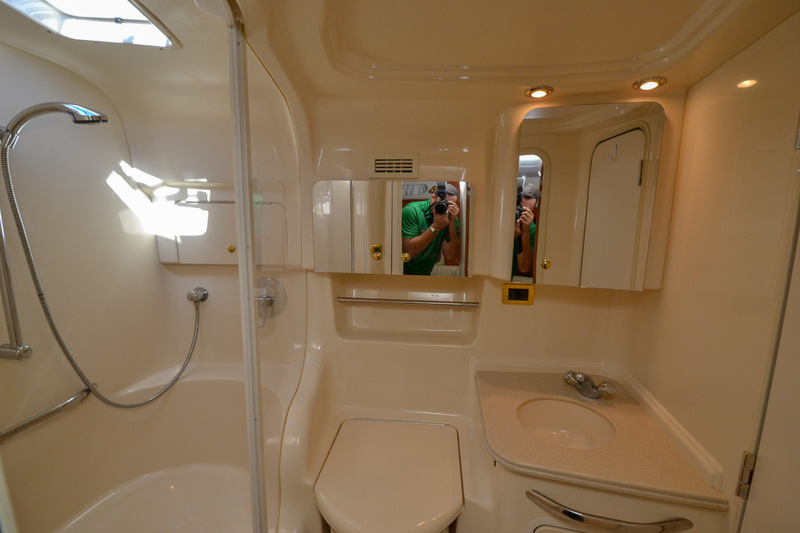 The mid stateroom also has its own head with VacuFlush toilet, sink and vanity. 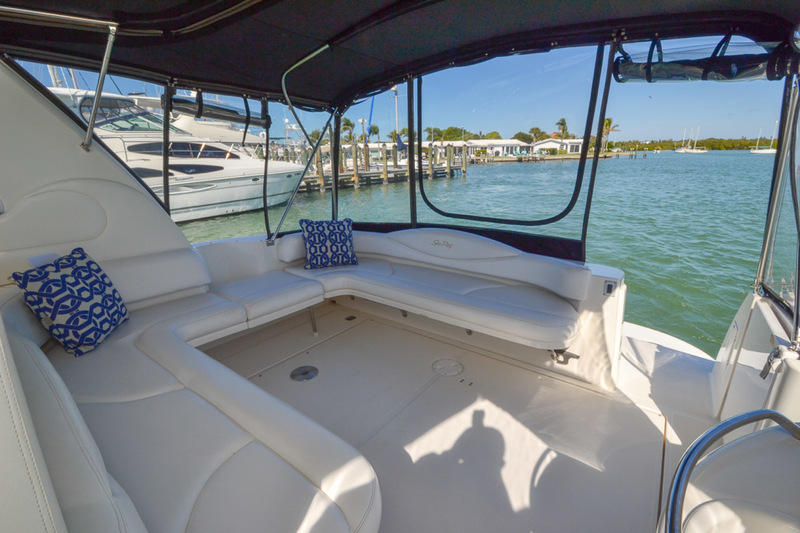 In the salon area, there's a comfortable sleeper sofa, a dining table, floor storage and a standard entertainment center featuring a HDTV & DVD. 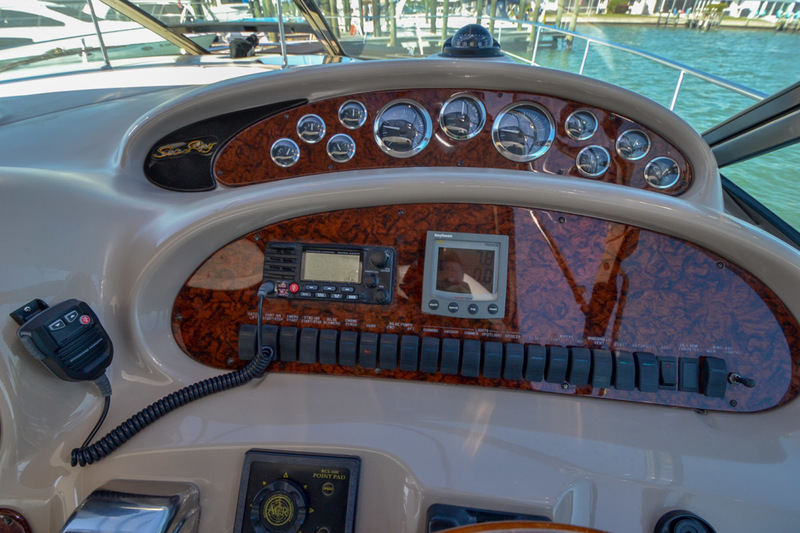 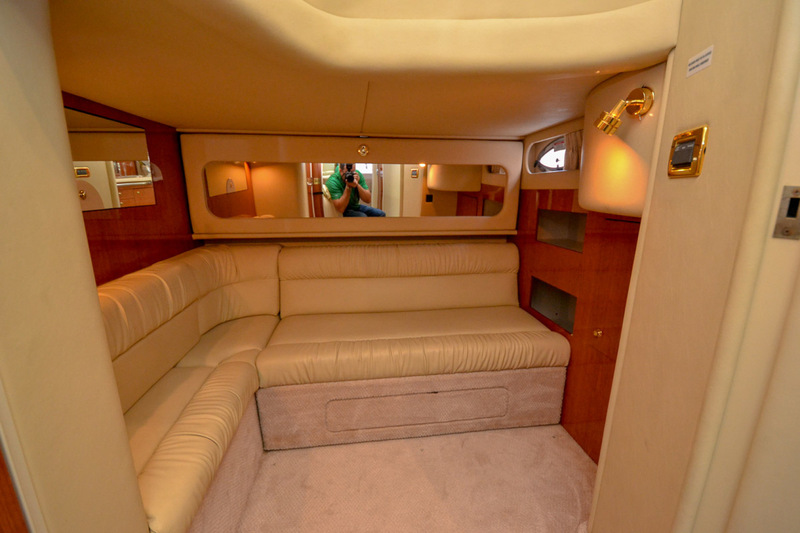 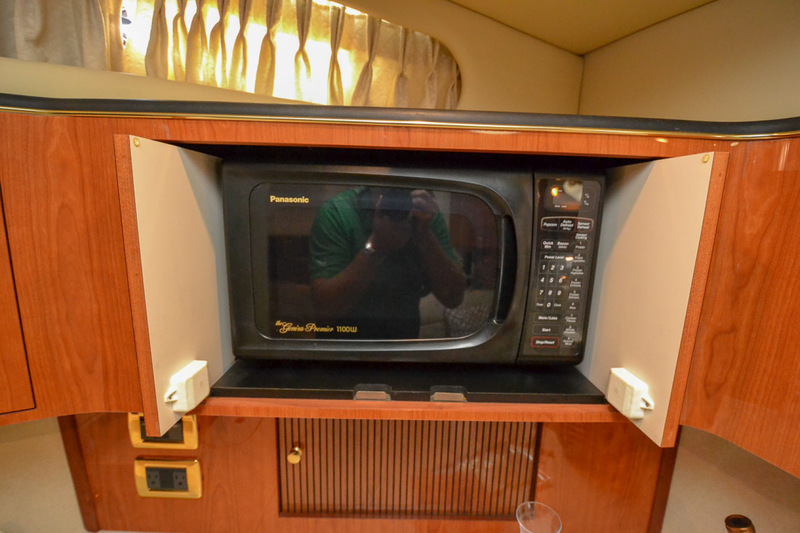 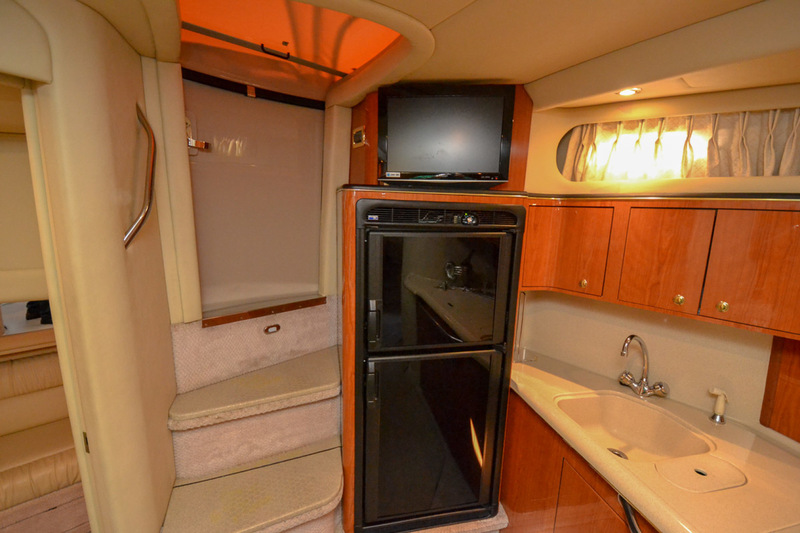 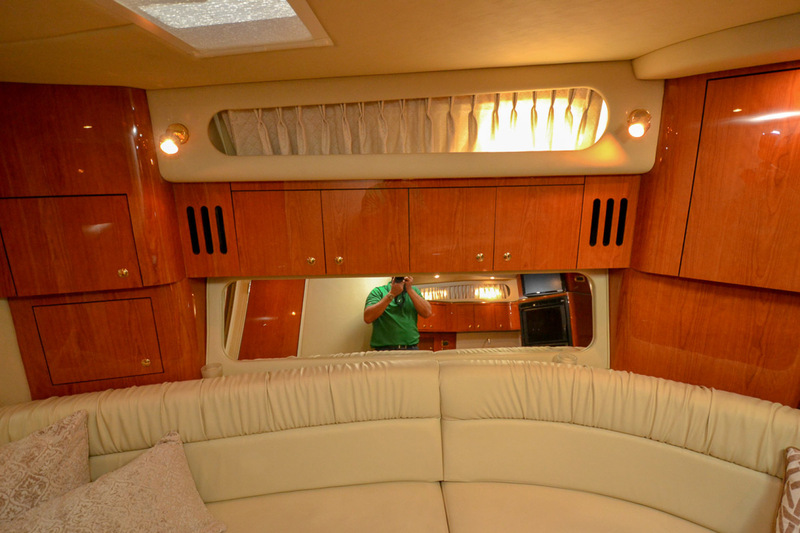 Other cabin standards include granite-look countertops, deep-pile marine-grade carpet, handcrafted wood trim, even a Clarion stereo with a six-disc CD changer, eight speakers and a cockpit remote control. 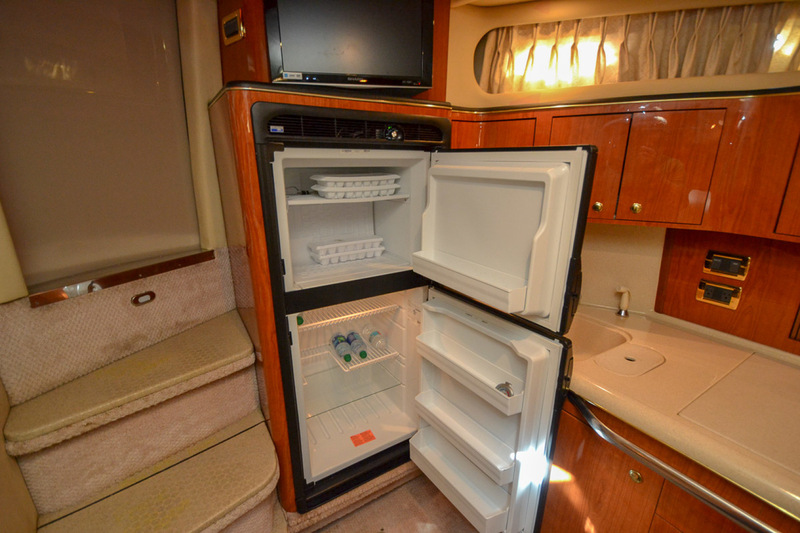 Life is simple in the galley with well-organized amenities like a recessed three-burner electric stove, a new refrigerator in 2016, a microwave, a Spacemaker coffee maker and fiberglass countertops with a Grohe faucet. 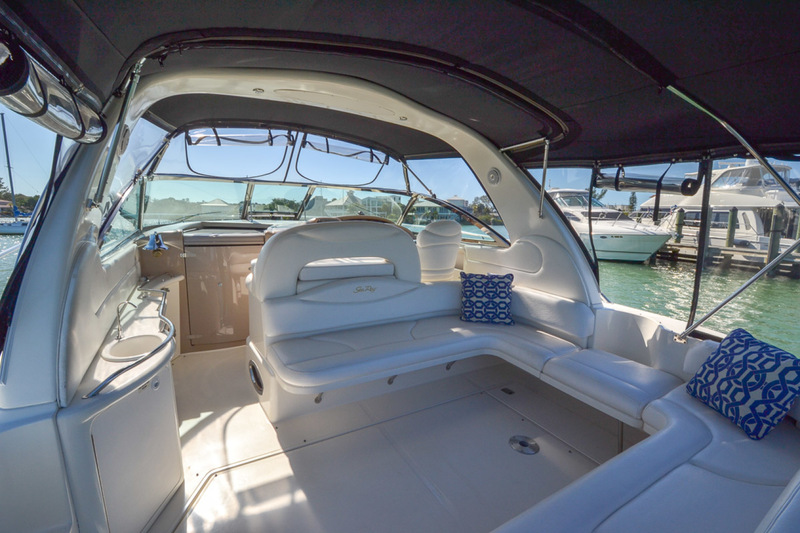 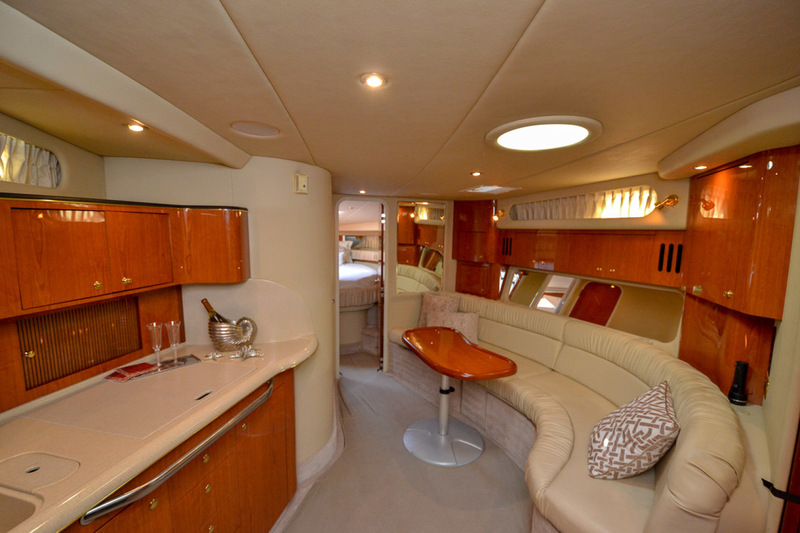 This boat is easy to show at the Venice Yacht Club by appointment. 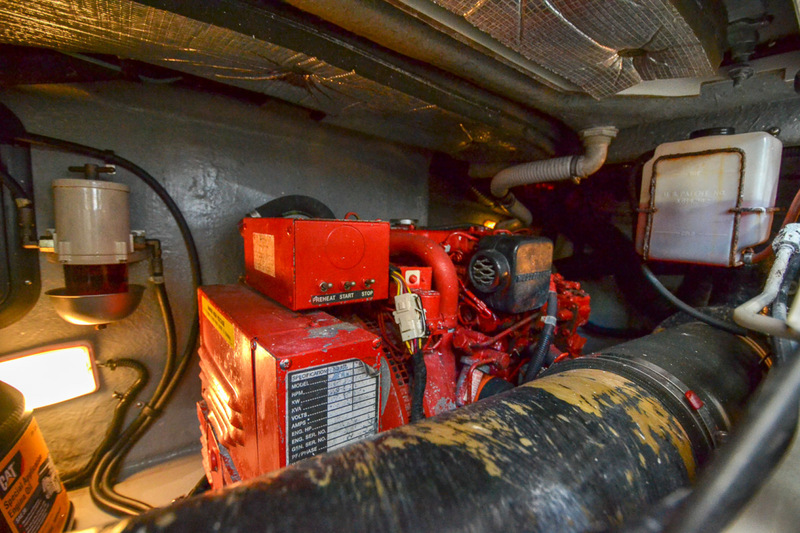 Mains - Oil, Filters, Impeller - Oil Samples Taken and sent to Caterpillar "Normal"